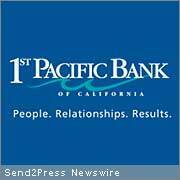 SAN DIEGO, Calif. /California Newswire/ — 1st Pacific Bancorp (NASDAQ: FPBN), the parent of 1st Pacific Bank of California, announced today the appointment of Marshall V. Laitsch as a director of 1st Pacific Bancorp and 1st Pacific Bank. A seasoned Southern California banking veteran, Marshall Laitsch has over thirty-five years of experience in community and regional banking in Southern California. Mr. Laitsch began his banking career immediately after serving in the United States Army. He has held numerous executive level positions throughout his banking career including serving as President and Chief Executive Officer of Sunwest Bank in Orange County, California and Pacific Century Bank in Los Angeles and Orange County. Most recently Mr. Laitsch held the position of President and Board Director for the Southern California Division of Placer Sierra Bank. Mr. Laitsch is a graduate of Western Illinois University with a MBA degree in Finance and BA degree in Business Administration, Management and Accounting. 1st Pacific Bancorp ( NASDAQ:FPBN ) is the holding company for 1st Pacific Bank of California, San Diego’s leading local business bank. The bank offers a full complement of business products and services to meet the financial needs of professional firms, small- to mid-sized businesses, their owners and the people who work there. 1st Pacific Bank has a total of eight banking offices located in San Diego County: in the University Towne Center area, the Tri-Cities area of Oceanside, Mission Valley, the Inland North County, El Cajon, La Jolla, Solana Beach and downtown San Diego. For additional information, visit the company’s website at http://www.1stpacbank.com .